This page contains information about books related to the Town of Framingham, Massachusetts USA. 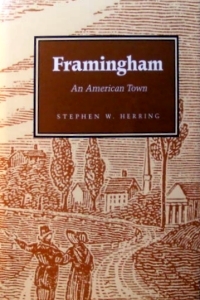 Some of the books are about Framingham, others were written by Framingham residents. 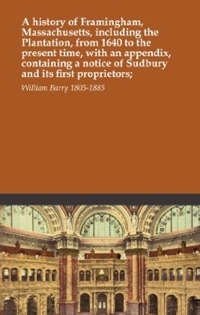 Description: The complete title as shown on the front page of the book is "History of Framingham, Massachusetts Early Known as Danforth's Farms, 1640-1880 with a Genealogical Register" and covers the settlement, incorporation and early history of the Town of Framingham, MA (USA). 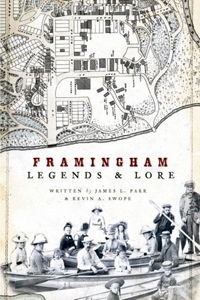 The book is regarded as the prime resource for the study of Framingham's history and people. 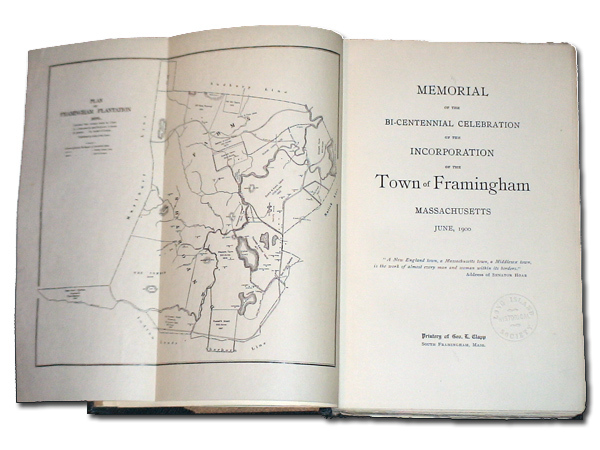 Description: Hardcover volume published as a Memorial of the Bi-Centennial celebration of the incorporation of the town of Framingham Massachusetts, June 1900. 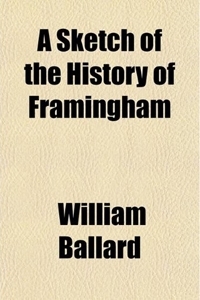 The book contains accounts of how the people of Framingham celebrated the 200th anniversary of the town. 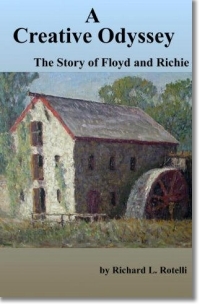 The book contains maps, drawings, photos and articles about the town and the celebration. The book is the work of the "Committee on Memorial Volume" which included; John H. Temple (Chairman), Constantine C. Esty, (also known as "C.C. "), Franklin Hutchinson, John H. Merriam and James E. McGrath. The book is filled with works by many other contributors including text of sermons and speeches given in honor of the Bi-Centennial. Even a copy of the banquet menu is included --- and of course they served Nobscot Mountain Spring Water! The image below shows a 1699 map of the "Framingham Plantation" which folds out of the inside front page of the book. Long before railroads and highways, the map shows the geography of Framingham as several dozen farms and homesteads and lists land grants and names and has marks where individual family homes were located in 1699. The map was drawn the year before the Town was incorporated in 1700. Publisher: Geo. L. Clapp, South Framingham, Mass. 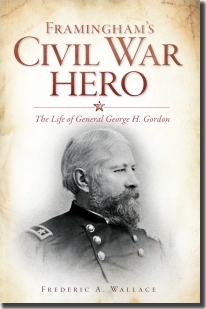 Description: biography of General George H. Gordon who moved to Framingham at the age of 5, got his early early education at the Old Academy in Framingham, went on to West Point where he was classmates with Stonewall Jackson, George McClellan and Ulysses S. Grant, then went on to command the Second Massachusetts Infantry. Includes some of Gordon's personal diary entries and letters. 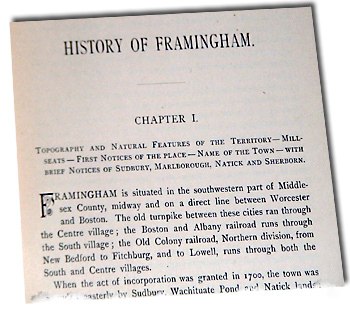 Description: Framingham, MA edition of the popular photo-journal styled Images of America series of books which contain historic images including photographs, posters, signs, documents, photos of items, postcards and other images which convey the history of particular locale. Description: Photos, illustrations and text chronicling turn of the century life in Massachusetts. 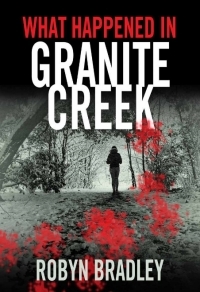 This book has several ties to Framingham. First, there are several photos of locations in Framingham in the book. Next is Nutting's factory, the Old America Company, which was located on Park St., in Framingham. 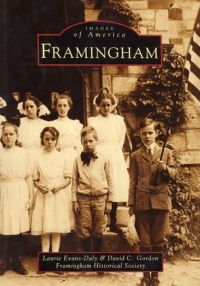 And, finally is Framingham's residents, many who worked as "colorists" and hand-tinted Nutting's photographs. 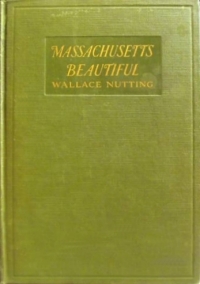 At the highpoint of Nutting's popularity it was said that not a home in America is without a Wallace Nutting image, (and it was probably true -- the company sold framed and matted prints, wood framed mirrors with small images adorning the mirror, and Nutting's images were licensed for use in printing calendars, magazines, and many other household items). Description: Takes a close-up look at the Framingham Heart Study, which began in 1948, and the revolutionary information it has provided about cardiovascular disease and its lifestyle component, and explains how by limiting risk factors--fat and alcohol intake, smoking, excess weight, physical inactivity, and stress--and monitoring blood pressure and cholesterol can reduce the ailment. The findings of the Framingham Heart Study�begun in 1948�have been nothing short of revolutionary. Over the years, they have provided conclusive evidence that cardiovascular disease is largely the result of measurable and modifiable risk factors, and that individuals can gain control over their heart health by looking carefully at their diet and lifestyle and changing their intake of saturated fat, cholesterol, and tobacco smoke; losing weight or becoming physically active; and regulating their levels of stress and blood pressure. It is principally because of the Heart Study that this understanding of what was once deemed a "silent killer" today seems intuitive. The study asked 5,209 citizens of Framingham, Massachusetts who overate, smoked, and suffered heart attacks and strokes to the same extent as the rest of the United States to undergo biennial physicals, blood tests, and detailed interviews concerning their behavior. The results changed the course of medical history. Written by the Study's director and a national health reporter, A Change of Heart is the first account of this heroic cooperation between the U.S. Public Health Service and the people of Framingham. 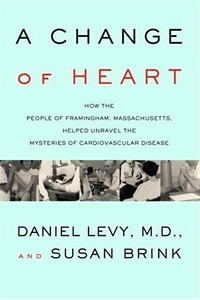 It is a fascinating, clear-eyed assessment of the achievements and challenges of the Framingham Heart Study to date, and of its continuing importance. 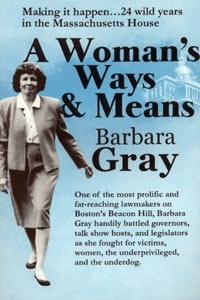 Description: Framingham's state rep for 24 years, one of the most prolific and far-reaching lawmakers on Boston's Beacon Hill, champion of controversial issues, including Right to Choose, Battered Women's Syndrome, Gay Rights, River Protection, Abuse Prevention and Seat Belt Laws. 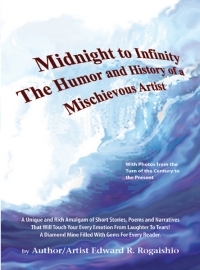 Includes special appendix, the history of MCI-Framingham, the nation's oldest women's prison. Description: an inspiring true story of two unique men; one with a strong determination to foster his talent for art and to make his own way in the world, in spite of being paralyzed, with only the use of his right arm; the other, a gifted and inventive self-taught designer/builder. 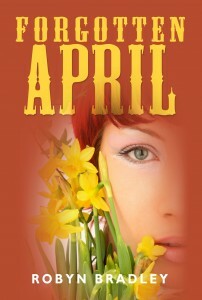 It is an uplifting story that touches the heart at many levels. 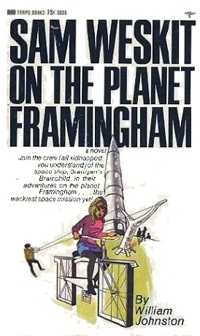 Description: (from cover) "Join the crew (all kidnapped you understand) of the space ship, Branigan's Brainchild, in their adventures on the planet Framingham -- the wackiest space mission yet"
Please contact us if you have information about other Framingham Books including; books about the town, it's history, it's people, and books written by Framingham authors.